The storm was first analyzed by ship data south of the Cape Verde Islands on September 9. Over the next ten days, it steadily gathered strength and slowly tracked to the west-northwest; it is estimated to have reached Category 5 intensity by September 20, while centered east of the Bahamas. It then veered northward in response to a deep trough over Appalachia, sparing the Bahamas, Florida, the Carolinas, and the Mid-Atlantic states. At the same time, a high pressure system was centered north of Bermuda, preventing the hurricane from making an eastward turn out to sea. Thus, the hurricane was effectively squeezed to the north between the two weather systems. This caused the storm's forward speed to increase substantially late on September 20, ultimately reaching 70 mph, the highest forward velocity ever recorded in the annals of hurricanes. This extreme forward motion was in the same general direction as the winds on the eastern side of the storm as it proceeded north; this, in turn, caused the wind speed to be far higher in areas east of the storm's eye than would be the case with a hurricane of more typical forward speed. The storm was centered several hundred miles to the southeast of Cape Hatteras during the early hours of September 21, and it weakened slightly. By 8:30 am EDT, it was centered approximately 100 miles (160 km) due east of Cape Hatteras, and its forward speed had increased to well over 50 mph. This rapid movement did not permit enough time for the storm to weaken over the cooler waters before it reached Long Island. The hurricane sped through the Virginia tidewater during the 9:00 am hour. Between 12:00 pm and 2:00 pm, the New Jersey coastline and New York City caught the western edge. At the same time, weather conditions began to deteriorate rapidly on Long Island and along the southern New England coast. The hurricane made landfall at Bellport on Long Island's Suffolk County sometime between 2:10 pm and 2:40 pm as a Category 3 hurricane, with sustained winds of 120 mph.It made a second landfall as a Category 3 hurricane somewhere between Bridgeport and New Haven, Connecticut at around 4:00 pm, with sustained winds of 115 mph. The storm's eye moved into western Massachusetts by 5:00 pm, and it reached Vermont by 6:00 pm. Both Westfield, Massachusetts and Dorset, Vermont reported calm conditions and partial clearing during passage of the eye, which is a rather unusual occurrence for a New England hurricane. The hurricane began to lose tropical characteristics as it continued into northern Vermont, though it was still carrying hurricane-force winds. It crossed into Quebec at approximately 10:00 pm, transitioning into a post-tropical low. The post-tropical remnants dissipated over northern Ontario a few days later. In 1938, United States forecasting lagged behind forecasting in Europe, where new techniques were being used to analyze air masses, taking into account the influence of fronts. A confidential report was released by the United States Forest Service, the parent agency of the United States Weather Bureau. It described the weather bureau's forecasting as "a sorry state of affairs" where forecasters had poor training and systematic planning was not used, and where forecasters had to "scrape by" to get information wherever they could. The Jacksonville, Florida, office of the weather bureau issued a warning on September 19 that a hurricane might hit Florida. Residents and authorities made extensive preparations, as they had endured the Labor Day Hurricane three years earlier. When the storm turned north, the office issued warnings for the Carolina coast and transferred authority to the bureau's headquarters in Washington. At 9:00 am on September 21, the Washington office issued northeast storm warnings north of Atlantic City and south of Block Island, Rhode Island, and southeast storm warnings from Block Island to Eastport, Maine. The advisory, however, underestimated the storm's intensity and said that it was farther south than it actually was. The office had yet to forward any information about the hurricane to the New York City office. At 10:00 am, the bureau downgraded the hurricane to a tropical storm. The 11:30 am advisory mentioned gale-force winds but nothing about a tropical storm or hurricane. That day, 28 year-old rookie Charles Pierce was standing in for two veteran meteorologists. He concluded that the storm would be squeezed between a high-pressure area located to the west and a high-pressure area to the east, and that it would be forced to ride up a trough of low pressure into New England. A noon meeting was called and Pierce presented his conclusion, but he was overruled by "celebrated" chief forecaster Charles Mitchell and his senior staff. In Boston, meteorologist E.B. Rideout told his WEEI radio listeners (to the skepticism of his peers) that the hurricane would hit New England. At 2:00 pm, hurricane-force gusts were occurring on Long Island's South Shore and near hurricane-force gusts on the coast of Connecticut. The Washington office issued an advisory saying that the storm was 75 miles east-southeast of Atlantic City and would pass over Long Island and Connecticut. Re-analysis of the storm suggests that the hurricane was farther north (just 50 miles from Fire Island), and that it was stronger and larger than the advisory said. The majority of the storm damage was from storm surge and wind. Damage was estimated at $308 million, the equivalent of $5.1 billion adjusted for inflation in 2016 dollars, making it among the most costly hurricanes to strike the U.S. mainland. It is estimated that, if an identical hurricane had struck in 2005, it would have caused $39.2 billion in damage due to changes in population and infrastructure. Approximately 600 people died in the storm in New England, most in Rhode Island, and up to 100 people elsewhere in the path of the storm. An additional 708 people were reported injured. In total, 4,500 cottages, farms, and other homes were reported destroyed and 25,000 homes were damaged. Other damages included 26,000 automobiles destroyed and 20,000 electrical poles toppled. The hurricane also devastated the forests of the Northeast, knocking down an estimated two billion trees in New York and New England. Freshwater flooding was minimal, however, as the quick passage of the storm decreased local rainfall totals, with only a few small areas receiving over 10 inches (250 mm). Over 35% of New England's total forest area was affected. In all, over 2.7 billion board feet of trees fell because of the storm, although 1.6 billion board feet of the trees were salvaged. The Northeastern Timber Salvage Administration (NETSA) was established to deal with the extreme fire hazard that the fallen timber had created. In many locations, roads from the fallen tree removal were visible decades later, and some became trails still used today. The New York, New Haven and Hartford Railroad from New Haven to Providence was particularly hard hit, as countless bridges along the Shore Line were destroyed or flooded, severing rail connections to badly affected cities such as Westerly, Rhode Island. Due to the lack of technology back in 1938, Long Island residents were not warned of the hurricane's arrival,leaving no time to prepare or evacuate. Long Island was struck first, before New England and Quebec, earning the storm the nickname the "Long Island Express." The winds reached up to 150 mph with waves surging to around 25–35 feet high. Yale and Harvard both owned large forests managed by their forestry departments, but both forests were wiped out by the hurricane. However, Yale had a backup forest at Great Mountain in northwestern Connecticut which was spared from the totality of the damages, and they were able to keep their forestry program running, which maintains operation today. Harvard's program, however, was reduced as a result. The storm surge hit Westerly, Rhode Island at 3:50 pm, resulting in 100 deaths. The tide was higher than usual because of the autumnal equinox and full moon, and the hurricane produced storm tides of 14 to 18 feet (5 m) along most of the Connecticut coast, with 18 to 25-foot (8 m) tides from New London east to Cape Cod—including the entire coastline of Rhode Island. The storm surge was especially violent along the Rhode Island shore, sweeping hundreds of summer cottages out to sea. Low-lying Block Island was almost completely underwater, and many drowned. As the surge drove northward through Narragansett Bay, it was restricted by the Bay's funnel shape and rose to 15.8 feet above normal spring tides, resulting in more than 13 feet (4.0 m) of water in some areas of downtown Providence. Several motorists were drowned in their automobiles. In Jamestown, seven children were killed when their school bus was blown into Mackerel Cove. Many stores in downtown Providence were looted by mobs, often before the flood waters had fully subsided and due in part to the economic difficulties of the Great Depression. Many homes and structures were destroyed along the coast, as well as many structures inland along the hurricane's path. Entire beach communities were obliterated on the coast of Rhode Island. Napatree Point was completely swept away, a small cape that housed nearly 40 families between the Atlantic Ocean and Little Narragansett Bay just off of Watch Hill. Today, Napatree is a wildlife refuge with no human inhabitants. One house in Charlestown, Rhode Island was lifted and deposited across the street, where it stood until it was demolished in August 2011. Even to this day, concrete staircases and boardwalk bases destroyed by the hurricane can be found when sand levels are low on some beaches. The boardwalk along Easton's Beach in Newport was completely destroyed by the storm. A few miles from Conanicut Island, Whale Rock Light was swept off its base and into the raging waves, killing lighthouse keeper Walter Eberle. His body was never found. The Prudence Island Light suffered a direct blow from the storm surge, which measured 17 feet 5 inches at Sandy Point. The masonry tower was slightly damaged. However, the adjoining light keeper's home was utterly destroyed and washed out to sea. The light keeper's wife and son were both killed, as well as the former light keeper and a couple who left their summer cottages near the lighthouse and sought shelter in what they thought was the sturdier light keeper's home. Light keeper George T. Gustavus was thrown free from the wreckage of the house and was saved by an island resident who held a branch into the water from the cliffs farther down the coast. Gustavus and Milton Chase, the owner of the island's power plant, reactivated the light during the storm by running a cable from the plant to the light and installing a light bulb, marking the first time that it was illuminated with electricity. Eastern Connecticut was on the eastern side of the hurricane. Long Island acted as a buffer against large ocean surges, but the waters of Long Island Sound rose to great heights. 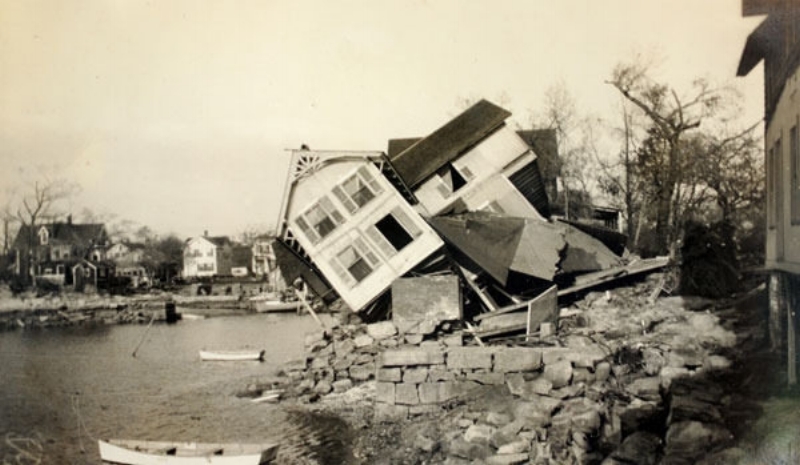 Small shoreline towns to the east of New Haven experienced much destruction from the water and winds, and the 1938 hurricane holds the record for the worst natural disaster in Connecticut's 350-year history. The mean low-water storm tide was 14.1 feet at Stamford, 12.8 feet at Bridgeport, and 10.58 feet at New London, which remains a record high. In the shoreline towns of Madison, Clinton, Westbrook, and Old Saybrook, buildings were found as wreckage across coastal roads. Actress Katharine Hepburn waded to safety from her Old Saybrook beach home, narrowly escaping death. She stated in her 1991 book that 95% of her personal belongings were either lost or destroyed, including her 1932 Oscar, which was later found intact. In Old Lyme, beach cottages were flattened or swept away. The NY NH&H passenger train Bostonian became stuck in debris at Stonington. Two passengers drowned while attempting to escape before the crew was able to clear the debris and get the train moving. Along the Stonington shorefront, buildings were swept off their foundations and found two miles (3 km) inland. Rescuers found live fish and crabs in kitchen drawers and cabinets while searching for survivors in the homes in Mystic. New London was first swept by the winds and storm surge, after which the waterfront business district caught fire and burned out of control for 10 hours. Stately homes along Ocean Beach were leveled by the storm surge. The permanently anchored 240-ton lightship at the head of New London Harbor was found on a sand bar two miles (3 km) away.